A 2013 attack by Xie Tao, Fanbao Liu, and Dengguo Feng breaks MD5 collision resistance in 218 time. This attack runs in less than a second on a regular computer. MD5 is prone to length extension attacks. One basic requirement of any cryptographic hash function is that it should be computationally infeasible to find two distinct messages that hash to the same value. MD5 fails this requirement catastrophically; such collisions can be found in seconds on an ordinary home computer. The weaknesses of MD5 have been exploited in the field, most infamously by the Flame malware in 2012. The CMU Software Engineering Institute considers MD5 essentially "cryptographically broken and unsuitable for further use". MD5 was designed by Ronald Rivest in 1991 to replace an earlier hash function MD4, and was specified in 1992 as RFC 1321. In 1993, Den Boer and Bosselaers gave an early, although limited, result of finding a "pseudo-collision" of the MD5 compression function; that is, two different initialization vectors that produce an identical digest. In 1996, Dobbertin announced a collision of the compression function of MD5 (Dobbertin, 1996). While this was not an attack on the full MD5 hash function, it was close enough for cryptographers to recommend switching to a replacement, such as SHA-1 or RIPEMD-160. The size of the hash value (128 bits) is small enough to contemplate a birthday attack. MD5CRK was a distributed project started in March 2004 with the aim of demonstrating that MD5 is practically insecure by finding a collision using a birthday attack. MD5CRK ended shortly after 17 August 2004, when collisions for the full MD5 were announced by Xiaoyun Wang, Dengguo Feng, Xuejia Lai, and Hongbo Yu. Their analytical attack was reported to take only one hour on an IBM p690 cluster. On 1 March 2005, Arjen Lenstra, Xiaoyun Wang, and Benne de Weger demonstrated construction of two X.509 certificates with different public keys and the same MD5 hash value, a demonstrably practical collision. The construction included private keys for both public keys. A few days later, Vlastimil Klima described an improved algorithm, able to construct MD5 collisions in a few hours on a single notebook computer. On 18 March 2006, Klima published an algorithm that could find a collision within one minute on a single notebook computer, using a method he calls tunneling. Various MD5-related RFC errata have been published. In 2009, the United States Cyber Command used an MD5 hash value of their mission statement as a part of their official emblem. On 24 December 2010, Tao Xie and Dengguo Feng announced the first published single-block (512-bit) MD5 collision. (Previous collision discoveries had relied on multi-block attacks.) For "security reasons", Xie and Feng did not disclose the new attack method. They issued a challenge to the cryptographic community, offering a US$10,000 reward to the first finder of a different 64-byte collision before 1 January 2013. Marc Stevens responded to the challenge and published colliding single-block messages as well as the construction algorithm and sources. In 2011 an informational RFC 6151 was approved to update the security considerations in MD5 and HMAC-MD5. The security of the MD5 hash function is severely compromised. A collision attack exists that can find collisions within seconds on a computer with a 2.6 GHz Pentium 4 processor (complexity of 224.1). Further, there is also a chosen-prefix collision attack that can produce a collision for two inputs with specified prefixes within hours, using off-the-shelf computing hardware (complexity 239). The ability to find collisions has been greatly aided by the use of off-the-shelf GPUs. On an NVIDIA GeForce 8400GS graphics processor, 16–18 million hashes per second can be computed. An NVIDIA GeForce 8800 Ultra can calculate more than 200 million hashes per second. These hash and collision attacks have been demonstrated in the public in various situations, including colliding document files and digital certificates. As of 2015, MD5 was demonstrated to be still quite widely used, most notably by security research and antivirus companies. In 1996, a flaw was found in the design of MD5. While it was not deemed a fatal weakness at the time, cryptographers began recommending the use of other algorithms, such as SHA-1, which has since been found to be vulnerable as well. In 2004 it was shown that MD5 is not collision-resistant. As such, MD5 is not suitable for applications like SSL certificates or digital signatures that rely on this property for digital security. Also in 2004 more serious flaws were discovered in MD5, making further use of the algorithm for security purposes questionable; specifically, a group of researchers described how to create a pair of files that share the same MD5 checksum. Further advances were made in breaking MD5 in 2005, 2006, and 2007. In December 2008, a group of researchers used this technique to fake SSL certificate validity. As of 2010, the CMU Software Engineering Institute considers MD5 "cryptographically broken and unsuitable for further use", and most U.S. government applications now require the SHA-2 family of hash functions. In 2012, the Flame malware exploited the weaknesses in MD5 to fake a Microsoft digital signature. In 1996, collisions were found in the compression function of MD5, and Hans Dobbertin wrote in the RSA Laboratories technical newsletter, "The presented attack does not yet threaten practical applications of MD5, but it comes rather close ... in the future MD5 should no longer be implemented ... where a collision-resistant hash function is required." In 2005, researchers were able to create pairs of PostScript documents and X.509 certificates with the same hash. Later that year, MD5's designer Ron Rivest wrote that "md5 and sha1 are both clearly broken (in terms of collision-resistance)". On 30 December 2008, a group of researchers announced at the 25th Chaos Communication Congress how they had used MD5 collisions to create an intermediate certificate authority certificate that appeared to be legitimate when checked by its MD5 hash. The researchers used a cluster of Sony PlayStation 3 units at the EPFL in Lausanne, Switzerland to change a normal SSL certificate issued by RapidSSL into a working CA certificate for that issuer, which could then be used to create other certificates that would appear to be legitimate and issued by RapidSSL. VeriSign, the issuers of RapidSSL certificates, said they stopped issuing new certificates using MD5 as their checksum algorithm for RapidSSL once the vulnerability was announced. Although Verisign declined to revoke existing certificates signed using MD5, their response was considered adequate by the authors of the exploit (Alexander Sotirov, Marc Stevens, Jacob Appelbaum, Arjen Lenstra, David Molnar, Dag Arne Osvik, and Benne de Weger). Bruce Schneier wrote of the attack that "we already knew that MD5 is a broken hash function" and that "no one should be using MD5 anymore". The SSL researchers wrote, "Our desired impact is that Certification Authorities will stop using MD5 in issuing new certificates. We also hope that use of MD5 in other applications will be reconsidered as well." In 2012, according to Microsoft, the authors of the Flame malware used an MD5 collision to forge a Windows code-signing certificate. Both produce the MD5 hash 79054025255fb1a26e4bc422aef54eb4. The difference between the two samples is that the leading bit in each nibble has been flipped. For example, the 20th byte (offset 0x13) in the top sample, 0x87, is 10000111 in binary. The leading bit in the byte (also the leading bit in the first nibble) is flipped to make 00000111, which is 0x07, as shown in the lower sample. Later it was also found to be possible to construct collisions between two files with separately chosen prefixes. This technique was used in the creation of the rogue CA certificate in 2008. A new variant of parallelized collision searching using MPI was proposed by Anton Kuznetsov in 2014, which allowed to find a collision in 11 hours on a computing cluster. In April 2009, a preimage attack against MD5 was published that breaks MD5's preimage resistance. This attack is only theoretical, with a computational complexity of 2123.4 for full preimage. MD5 digests have been widely used in the software world to provide some assurance that a transferred file has arrived intact. For example, file servers often provide a pre-computed MD5 (known as md5sum) checksum for the files, so that a user can compare the checksum of the downloaded file to it. Most unix-based operating systems include MD5 sum utilities in their distribution packages; Windows users may use the included PowerShell function "Get-FileHash", install a Microsoft utility, or use third-party applications. Android ROMs also use this type of checksum. As it is easy to generate MD5 collisions, it is possible for the person who created the file to create a second file with the same checksum, so this technique cannot protect against some forms of malicious tampering. In some cases, the checksum cannot be trusted (for example, if it was obtained over the same channel as the downloaded file), in which case MD5 can only provide error-checking functionality: it will recognize a corrupt or incomplete download, which becomes more likely when downloading larger files. Historically, MD5 has been used to store a one-way hash of a password, often with key stretching. NIST does not include MD5 in their list of recommended hashes for password storage. MD5 is also used in the field of electronic discovery, in order to provide a unique identifier for each document that is exchanged during the legal discovery process. This method can be used to replace the Bates stamp numbering system that has been used for decades during the exchange of paper documents. As above, this usage should be discouraged due to the ease of collision attacks. Figure 1. One MD5 operation. MD5 consists of 64 of these operations, grouped in four rounds of 16 operations. F is a nonlinear function; one function is used in each round. Mi denotes a 32-bit block of the message input, and Ki denotes a 32-bit constant, different for each operation. s denotes a left bit rotation by s places; s varies for each operation. denote the XOR, AND, OR and NOT operations respectively. The MD5 hash is calculated according to this algorithm. All values are in little-endian. //  where the first bit is the most significant bit of the byte. 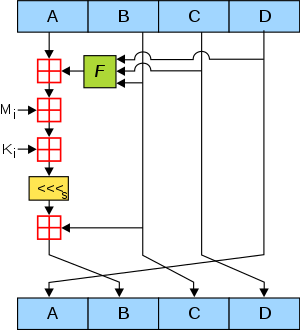 The MD5 algorithm is specified for messages consisting of any number of bits; it is not limited to multiples of eight bit (octets, bytes). Some MD5 implementations such as md5sum might be limited to octets, or they might not support streaming for messages of an initially undetermined length. ^ Rivest, R. (April 1992). "Step 4. Process Message in 16-Word Blocks". The MD5 Message-Digest Algorithm. IETF. p. 5. sec. 3.4. doi:10.17487/RFC1321. RFC 1321. Retrieved 10 October 2018. ^ Xie Tao; Fanbao Liu & Dengguo Feng (2013). "Fast Collision Attack on MD5" (PDF). ^ Kleppmann, Martin (2 April 2017). Designing Data-Intensive Applications: The Big Ideas Behind Reliable, Scalable, and Maintainable Systems (1 ed.). O'Reilly Media. p. 203. ISBN 978-1449373320. ^ Chad R, Dougherty (31 December 2008). "Vulnerability Note VU#836068 MD5 vulnerable to collision attacks". Vulnerability notes database. CERT Carnegie Mellon University Software Engineering Institute. Retrieved 3 February 2017. ^ Ciampa, Mark (2009). CompTIA Security+ 2008 in depth. Australia ; United States: Course Technology/Cengage Learning. p. 290. ISBN 978-1-59863-913-1. ^ a b J. Black, M. Cochran, T. Highland: A Study of the MD5 Attacks: Insights and Improvements, 3 March 2006. Retrieved 27 July 2008. ^ Hawkes, Philip; Paddon, Michael; Rose, Gregory G. (13 October 2004). "Musings on the Wang et al. MD5 Collision". Cryptology ePrint Archive. Retrieved 10 October 2018. ^ Bishop Fox (26 September 2013). "Fast MD5 and MD4 Collision Generators". Retrieved 10 February 2014. Faster implementation of techniques in How to Break MD5 and Other Hash Functions, by Xiaoyun Wang, et al. Old (2006) average run time on IBM P690 supercomputer: 1 hour. New average run time on P4 1.6ghz PC: 45 minutes. ^ Lenstra, Arjen; Wang, Xiaoyun; Weger, Benne de (1 March 2005). "Colliding X.509 Certificates". Cryptology ePrint Archive. Retrieved 10 October 2018. ^ Klíma, Vlastimil (5 March 2005). "Finding MD5 Collisions – a Toy For a Notebook". Cryptology ePrint Archive. Retrieved 10 October 2018. ^ Vlastimil Klima: Tunnels in Hash Functions: MD5 Collisions Within a Minute, Cryptology ePrint Archive Report 2006/105, 18 March 2006, revised 17 April 2006. Retrieved 27 July 2008. ^ "Code Cracked! Cyber Command Logo Mystery Solved". USCYBERCOM. Wired News. 8 July 2010. Retrieved 29 July 2011. ^ Tao Xie; Dengguo Feng (2010). "Construct MD5 Collisions Using Just A Single Block Of Message" (PDF). Retrieved 28 July 2011. ^ "Marc Stevens – Research – Single-block collision attack on MD5". Marc-stevens.nl. 2012. Retrieved 10 April 2014. ^ "RFC 6151 – Updated Security Considerations for the MD5 Message-Digest and the HMAC-MD5 Algorithms". Internet Engineering Task Force. March 2011. Retrieved 11 November 2013. ^ "RFC 1321 – The MD5 Message-Digest Algorithm". Internet Engineering Task Force. April 1992. Retrieved 5 October 2013. ^ "RFC 2104 – HMAC: Keyed-Hashing for Message Authentication". Internet Engineering Task Force. February 1997. Retrieved 5 October 2013. ^ M.M.J. Stevens (June 2007). "On Collisions for MD5" (PDF). [...] we are able to find collisions for MD5 in about 224.1 compressions for recommended IHV's which takes approx. 6 seconds on a 2.6GHz Pentium 4. ^ Marc Stevens; Arjen Lenstra; Benne de Weger (16 June 2009). "Chosen-prefix Collisions for MD5 and Applications" (PDF). ^ "New GPU MD5 cracker cracks more than 200 million hashes per second." ^ Magnus Daum, Stefan Lucks. "Hash Collisions (The Poisoned Message Attack)". Eurocrypt 2005 rump session. Archived from the original on 27 March 2010. ^ Max Gebhardt; Georg Illies; Werner Schindler. "A Note on the Practical Value of Single Hash Collisions for Special File Formats" (PDF). ^ a b c d e Sotirov, Alexander; Marc Stevens; Jacob Appelbaum; Arjen Lenstra; David Molnar; Dag Arne Osvik; Benne de Weger (30 December 2008). "MD5 considered harmful today". Retrieved 30 December 2008. Announced at the 25th Chaos Communication Congress. ^ "Poisonous MD5 – Wolves Among the Sheep | Silent Signal Techblog". Retrieved 10 June 2015. ^ Hans Dobbertin (Summer 1996). "The Status of MD5 After a Recent Attack" (PDF). CryptoBytes. Retrieved 22 October 2013. ^ Xiaoyun Wang & Hongbo Yu (2005). "How to Break MD5 and Other Hash Functions" (PDF). Advances in Cryptology – Lecture Notes in Computer Science. pp. 19–35. Retrieved 21 December 2009. ^ Xiaoyun Wang, Dengguo ,k.,m.,m, HAVAL-128 and RIPEMD, Cryptology ePrint Archive Report 2004/199, 16 August 2004, revised 17 August 2004. Retrieved 27 July 2008. ^ Marc Stevens, Arjen Lenstra, Benne de Weger: Vulnerability of software integrity and code signing applications to chosen-prefix collisions for MD5, 30 November 2007. Retrieved 27 July 2008. ^ Stray, Jonathan (30 December 2008). "Web browser flaw could put e-commerce security at risk". CNET.com. Retrieved 24 February 2009. ^ "CERT Vulnerability Note VU#836068". Kb.cert.org. Retrieved 9 August 2010. ^ "NIST.gov — Computer Security Division — Computer Security Resource Center". Csrc.nist.gov. Retrieved 9 August 2010. ^ Dobbertin, Hans (Summer 1996). "The Status of MD5 After a Recent Attack" (PDF). RSA Laboratories CryptoBytes. 2 (2): 1. Retrieved 10 August 2010. The presented attack does not yet threaten practical applications of MD5, but it comes rather close. .... [sic] in the future MD5 should no longer be implemented... [sic] where a collision-resistant hash function is required. ^ "Schneier on Security: More MD5 Collisions". Schneier.com. Retrieved 9 August 2010. ^ "Colliding X.509 Certificates". Win.tue.nl. Retrieved 9 August 2010. ^ "[Python-Dev] hashlib — faster md5/sha, adds sha256/512 support". Mail.python.org. Retrieved 9 August 2010. ^ "Researchers Use PlayStation Cluster to Forge a Web Skeleton Key". Wired. 31 December 2008. Retrieved 31 December 2008. ^ Callan, Tim (31 December 2008). "This morning's MD5 attack — resolved". Verisign. Retrieved 31 December 2008. ^ Bruce Schneier (31 December 2008). "Forging SSL Certificates". Schneier on Security. Retrieved 10 April 2014. ^ "Flame malware collision attack explained". ^ Eric Rescorla (17 August 2004). "A real MD5 collision". Educated Guesswork (blog). Archived from the original on 15 August 2014. Retrieved 13 April 2015. ^ Anton A. Kuznetsov. "An algorithm for MD5 single-block collision attack using highperformance computing cluster" (PDF). IACR. Retrieved 3 November 2014. ^ Yu Sasaki; Kazumaro Aoki (16 April 2009). "Finding Preimages in Full MD5 Faster Than Exhaustive Search". Springer Berlin Heidelberg. ^ Ming Mao and Shaohui Chen and Jin Xu (2009). Construction of the Initial Structure for Preimage Attack of MD5. International Conference on Computational Intelligence and Security. 1. IEEE Computer Society. pp. 442–445. doi:10.1109/CIS.2009.214. ISBN 978-0-7695-3931-7. ^ "Availability and description of the File Checksum Integrity Verifier utility". Microsoft Support. 17 June 2013. Retrieved 10 April 2014. 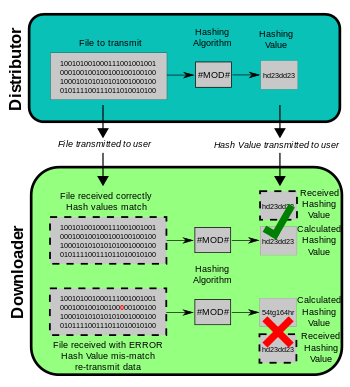 ^ "How to compute the MD5 or SHA-1 cryptographic hash values for a file". Microsoft Support. 23 January 2007. Retrieved 10 April 2014. ^ "FreeBSD Handbook, Security – DES, Blowfish, MD5, and Crypt". Retrieved 19 October 2014. ^ "Synopsis – man pages section 4: File Formats". Docs.oracle.com. 1 January 2013. Retrieved 10 April 2014. Berson, Thomas A. (1992). "Differential Cryptanalysis Mod 232 with Applications to MD5". EUROCRYPT. pp. 71–80. ISBN 3-540-56413-6. Bert den Boer; Antoon Bosselaers (1993). Collisions for the Compression Function of MD5. Berlin; London: Springer. pp. 293–304. ISBN 978-3-540-57600-6. Hans Dobbertin, Cryptanalysis of MD5 compress. Announcement on Internet, May 1996. "CiteSeerX". Citeseer.ist.psu.edu. Retrieved 9 August 2010. Dobbertin, Hans (1996). "The Status of MD5 After a Recent Attack" (PDF). CryptoBytes. 2 (2).